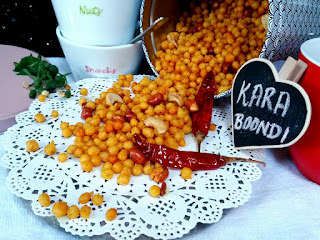 Kara Boondi , A spicy trail mix! Boondi, a droplet sized crispy deep fried Rajasthani snack made using Gram flour/Besan as it's main ingredient can be tricky and finicky but by following certain key points Boondi making becomes a pleasure. Adding few spices and fried nuts to the regular boondi makes it a perfect tea time munching, a good to go accompaniment/condiment for whole meals like Sambhar and curd rice. 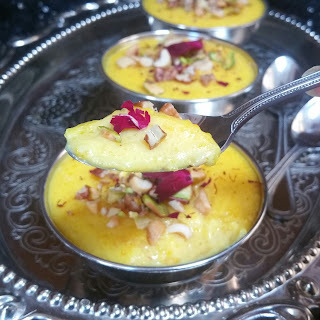 Shahi Kesar Phirni ,A Royal touch ! Phirni is a typical North Indian dessert made during majority of the occasions that includes Karwa chauth, Diwali and so on. Phirni is regularly made using Rice and Milk but adding Khoya and saffron makes it Shahi taking this to yet another level.